Do you still have tons of Thanksgiving leftovers still in your refrigerator? Are you sick of eating all of those leftovers yet? If the answer is yes to either of these questions then it is time to get a little creative by taking what you already have in your refrigerator and creating a whole new meal. It will feel like Thanksgiving was already so long ago, that is how different these dishes will taste. Now if you still want things to taste like Thanksgiving then just keep eating your leftovers like you have been. Combine the stuffing and parsley into beaten eggs. Brush the top and bottom of the waffle iron with oil. Evenly and firmly pack each section of the waffle iron full with the stuffing mixture. Close waffle iron and cook until golden and the waffles can easily be lifted out of the waffle iron, 4 to 6 minutes. Once the waffles are ready, top each with as much turkey as you want and close the waffle iron. Cook until the turkey is warmed through, 2 to 3 minutes. Transfer the waffles to 4 plates and top each with as much gravy and cranberry sauce as you’d like. In a large bowl, gently toss the turkey, celery, celery leaves, apple, grapes, and pecans until combined. In a small bowl, whisk together the yogurt, mayonnaise, honey, and 1/4 teaspoon salt until well combined. Put the celery root in a small bowl, add 2 tablespoons of the dressing, and toss to coat completely. Add the remaining dressing to the turkey mixture, season with salt and pepper, and toss gently to evenly dress the salad. Position a rack in the upper third of the oven and preheat to 450 degrees F.
Toss the turkey bones and parts, onions, ginger, and garlic with the vegetable oil in a large bowl. Lightly sprinkle with salt and transfer to a rimmed baking sheet, spreading everything out into a somewhat even layer (it is okay if some items slightly overlap). Roast turning the bones and vegetables halfway through until the vegetables are slightly charred, about 30 minutes. Meanwhile, add the star anise pods, peppercorns, and cinnamon sticks to a large pot. Set over medium heat and toast until very fragrant, shaking the pot occasionally, about 5 minutes. Turn off the heat and add the chicken broth, fish sauce, according to taste, and 8 cups of water. Divide the noodles among 6 bowls then top with the broth and shredded meat. 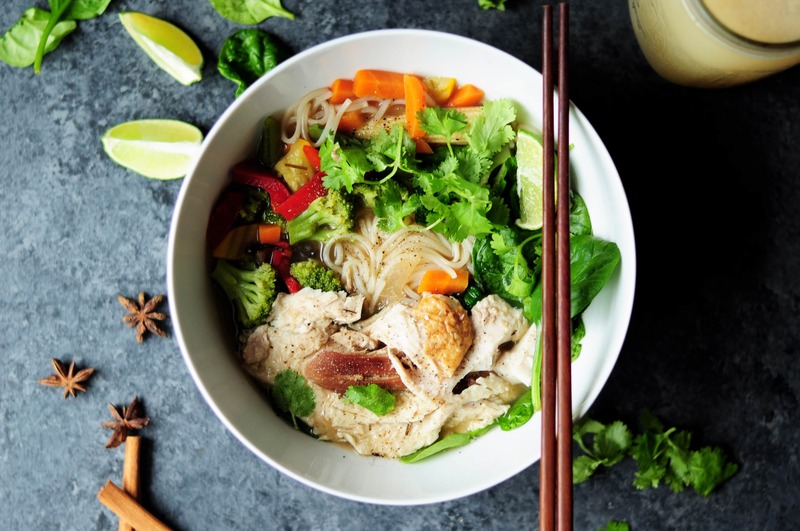 Serve with the bean sprouts, Thai basil, jalapenos, red onion, hoisin sauce, sriracha and a lime wedge on the side so that guests can top their pho as they like.